Recently had a discussion with a reporter at a major publication about genetic genealogy, and how genomics and ancient DNA has changed everything about what we know about the human. Though I did put in the caveat that it seems the New World has a mildly simpler history that aligns with what we’d somewhat expected or seen. I was wrong. It turns out that indigenous people of the Amazon have a few percent of ancestry derived from a population with the closest affinities to those of Australasia. The plot to the left roughly shows groups which share haplotypes when comparing the Mixe people of Mexico to other Amerindians. The stronger red shading shows an affinity between pairwise groups due to the putative admixture event. What you can see that various Australasian groups, as diverse as the Andaman Islanders and and Papuans show elevated signals of affinity with particular groups from the Amazon in comparison to the Mixe. The model is outlined in the figure at the top. What you can see is that a there was admixture into one of the first groups which arrived in the Americas. This group already had ancient Siberian ancestry. It then seems to have absorbed some ancestry from another group with affinities to the peoples of Australia. Because the dominant ancestral component of the hybrid group was similar to the sister American lineage a wide range of ancestral fractions from this group into the peoples of the Amazon are compatible with the statistics yielded by the data. Up to 85 percent, or as low as 2%. The lower the fraction of admixed “First Americans” into the Amazonian groups in question, the higher the Australian element in that group, as that ancestral element only spans a 1-2% range. In other words, if the admixed First American group contributed only 2% to the modern Amazonians, it would be in large part descended from the Andaman-like group. This detail matters because of what is brought up in the discussion of the paper, and has been mooted elsewhere: a lot of the older skeletons from this region of South America look different. One model, which the authors are skeptical of, is that admixture happened in the New World. That is, and outrider group of First Americans absorbed and older population which arrived earlier to the region. But Kennewick Man tells us that morphology is only a rough guide. The Anzik Clovis result did not yield any evidence of Andaman-like admixture. That means either there was structure coming into the New World. Or, the admixture happened here. From the patterns in the genome the admixture is old. But the confidence interval is big. It is not detectable by those methods sensitive to recent admixtures. It is older than 4,000 years. But, it is clearly post-Neandertal admixture. So younger than 50,000 years. In fact, the admixture graph at the top of this post suggests that this admixture post-dates that with the ancient Siberians. That means it is highly likely it probably dates to no older than ~20,000 years, since you need some time for the various Eurasian groups to actually diverge from about 40,000 years ago onward. The authors used a variety of methods to test this affinity that they detected. The ancestry fractions were low, so they wanted to see if the result was robust. It sees to be. I won’t get into the details, but I want to post the D-statistic table from the extended data. It uses a slightly different method the map above. Basically they’re testing explicit trees, and showing deviations from random drift along the independent paths which are compatible with gene flow across the tips of the tree. Admixture. It strikes me that D-statistics show a lot more affinity with South Asians broadly. Why weren’t the signals as strong as in the Chromopainter analysis above? I have no idea, but perhaps it might have to do with the fact that South and Southeast Asians are themselves admixed between the Andaman-like group, and other populations (West and Northeast Eurasians respectively). This may have made higher to detect the haplotypes in question. Additionally, the Ami, an indigenous people of Taiwan also show up on this list. What this implies is that a broad constellation of eastern peoples who diverged from the ancestors of Northeast Eurasians were widely present in the past. In South and Southeast Asia descendants of these people were probably dominant down deep into the Holocene. The elevated signatures in groups like the Andaman Islanders and Papuans may be due to the fact that these groups are relatively pristine. In 2011 the Reich group published a paper which actually suggested that there were multiple waves of old Southeast Eurasians with the Andaman Islanders being remnants of a group which contributed a secondary signal of admixture into the peoples of Oceania. This was published at about the same time as a whole genome analysis which suggested that Oceanians were descended from an earlier migration out of Africa, and not admixed. There are other groups which are supporting multiple out of Africa events now. The plot is getting thick and complicated. I only bring this up because much of the current work uses copious data to test explicit models. The authors are constraining the sample space of models, and if you select between ten models, it may still be that the best fit is not a really good fit to the “real” model of what actually happened. One reason ancient DNA has been revolutionary is that it has forced researchers to consider models that they would have otherwise thought ludicrous. There were long suggestions for example of common ancestry between Amerindians and Europeans…but these ideas were often discarded as implausible. There are all sorts of details in relation to modeling assumptions which give valid results which are nevertheless inaccurate. 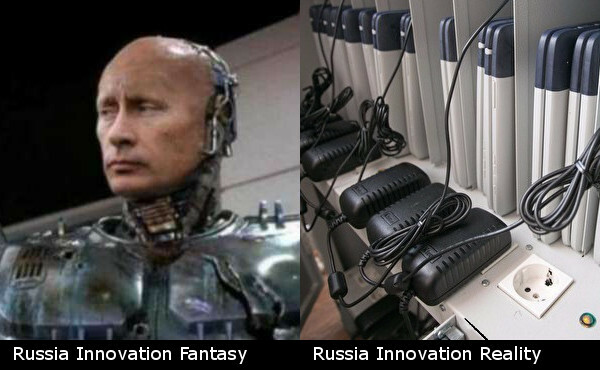 It is turning out that reality is crazier than our imaginations. Hold tight. 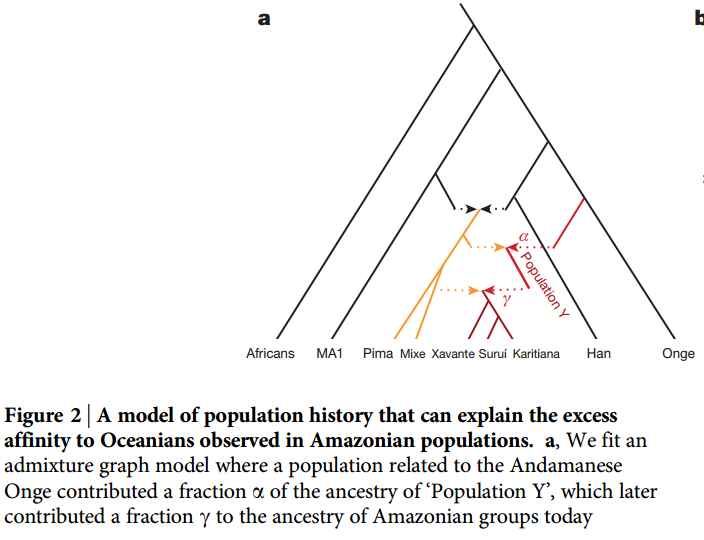 57 Comments to "Amazonians May Have Andaman-Like Admixture"
Two ancient human genomes reveal Polynesian ancestry among the indigenous Botocudos of Brazil. Current Biology 24, no. 21 (2014): R1035-R1037. Gonçalves VF, Stenderup J, Rodrigues-Carvalho C, et al. Identification of Polynesian mtDNA haplogroups in remains of Botocudo Amerindians from Brazil. Proceedings of the National Academy of Sciences of the United States of America. 2013;110(16):6465-6469. doi:10.1073/pnas.1217905110. A few years ago when a South Asian like signal was detected in Australia, I remembered Joseph Birdsell’s theory of a South Asian component in Australian ancestry. Now, the same Birdsell postulated an Australian component in American Indian ancestry although the examples he gave were California rather than South American Indians. Birdsell, of course was using morphology. I think some cultural anthropologists found South American-Australian affinities. Interestingly, Paleo-Indian remains that supposedly have Australian-like morphology don’t necessarily show the Australasian genetic signal. Those Botocudos were fully Polynesian. Many people myself included were sceptical about it being anything unrelated to post-Columbian affairs of Europeans, but who knows. Intra-Polynesian MDS shows the “Botocudos” cluster with Cook Islanders , who are the most eastern South Pacific population in the set. Ami were considered unadmixed Austronesians in the Lipson et al study about Austronesian population history from last year. Polynesians as expected are modeled as mixtures of Austronesian and Melanesian, while Negritos formed a deep clade with Melanesians (and Papuans/Australian Aboriginals). Perhaps this Oceanian affinity being Austronesian-related could explain the appearence of all these populations in the D-stats? Can be verified with ancient DNA from South America predating the Austronesian expansion. Also, another huge paper about Native Americans came out few hours ago. Includes ancient DNA and claims to refute “Oceanian-like” Paleoamerican scenario. "To further investigate this trend, we tested for additional gene flow from Eurasian populations into the Americas with D-statistics using the masked SNP chip genotype dataset (47). We found that some American populations, including the Aleutian Islanders, Surui, and Athabascans are closer to Australo-Melanesians compared to other Native Americans, such as North American Ojibwa, Cree and Algonquin, and the South American Purepecha, Arhuaco and Wayuu (fig. S10). The Surui are, in fact, one of closest Native American populations to East Asians and Australo-Melanesians, the latter including Papuans, non-Papuan Melanesians, Solomon Islanders, and South East Asian hunter-gatherers such as Aeta (fig. S10). We acknowledge that this observation is based on the analysis of a small fraction of the whole genome and SNP chip genotype datasets, especially for the Aleutian Islander data that is heavily masked due to recent admixture with Europeans (28), and that the trends in the data are weak. Nonetheless, if it proves correct, these results suggest there may be a distant Old World signal related to Australo-Melanesians and East Asians in some Native Americans. The widely scattered and differential affinity of Native Americans to the Australo-Melanesians, ranging from a strong signal in the Surui to much weaker signal in northern Amerindians such as Ojibwa, points to this gene flow occurring after the initial peopling by Native American ancestors. " Keep up the great reporting Razib. Fascinating stuff. "How and when the Americas were populated remains contentious. Using ancient and modern genome-wide data, we find that the ancestors of all present-day Native Americans, including Athabascans and Amerindians, entered the Americas as a single migration wave from Siberia no earlier than 23 thousand years ago (KYA), and after no more than 8,000-year isolation period in Beringia. Following their arrival to the Americas, ancestral Native Americans diversified into two basal genetic branches around 13 KYA, one that is now dispersed across North and South America and the other is restricted to North America. Subsequent gene flow resulted in some Native Americans sharing ancestry with present-day East Asians (including Siberians) and, more distantly, Australo-Melanesians. Putative ‘Paleoamerican’ relict populations, including the historical Mexican Pericúes and South American Fuego-Patagonians, are not directly related to modern Australo-Melanesians as suggested by the Paleoamerican Model. " “To further investigate this trend, we tested for additional gene flow from Eurasian populations into the Americas with D-statistics using the masked SNP chip genotype dataset (47). We found that some American populations, including the Aleutian Islanders, Surui, and Athabascans are closer to Australo-Melanesians compared to other Native Americans, such as North American Ojibwa, Cree and Algonquin, and the South American Purepecha, Arhuaco and Wayuu (fig. S10). The Surui are, in fact, one of closest Native American populations to East Asians and Australo-Melanesians, the latter including Papuans, non-Papuan Melanesians, Solomon Islanders, and South East Asian hunter-gatherers such as Aeta (fig. S10). We acknowledge that this observation is based on the analysis of a small fraction of the whole genome and SNP chip genotype datasets, especially for the Aleutian Islander data that is heavily masked due to recent admixture with Europeans (28), and that the trends in the data are weak. So again, we have the populations that are closest to Melanesians as the same ones with the least Denisovan admixture (at least relative to Neanderthal admixture). This seems pretty counterintuitive. Eyeballing the data, it looks like this entire spike could be a founder effect caused by 1-3 nuclear families within the founding population, perhaps fishermen who arrived sooner due to their maritime skills. Can anyone explain why Skoglund didn’t mask European admixture rather than just exclude admixed individuals? Is it too challenging? Excluding admixed individuals left out a lot of interesting groups in the Americas, including the Ojibwe. The Ojibwe have the highest Denisovan ancestry in the Americas – you’d think they’d be a population worth testing, rather than Chipewyans, who have none. Still digesting really. 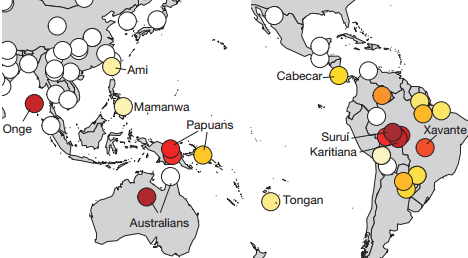 The paper on Denisovan ancestry suggests that its source in the Americas pre-dates the split between Papuan and Australian lineages, but post dates the Onge/Melanesian split. The Surui are the population with the lowest affinity to Denisovans in the Americas, yet they have the highest affinity to Australasians? And the Onge, with very low Denisovan affinity, have the highest affinity to Amazonians? What am I missing here? How can those be reconciled? It would be interesting to see how the On Your Knees Cave remains would shake out on this sort of analysis. That means either there was structure coming into the New World. Or, the admixture happened here. I thought Reich already identified a great deal of structure coming into the New World? It really wouldn’t be surprising that the amerinds that came via Beringia would greatly benefit from the hot and humid adaptations brought to them by the admixture with these arrivers from a hot and humid place. You really can’t get much more opposite in climate than Beringia and the Amazon. These Andaman-like people could have brought genes that were incredibly helpful in living in the tropics that had been lost by the arrivals from Beringia. Following this line of thinking even if the Andaman-like people arrived in small numbers after the complete colonization of South America their genes could have spread far and wide. To me the hardest part to grok is not that there might be a few percent Austro-Melanesian admixture in Native Americans. It’s how it could be found in only some Native Americans. Presuming the “pure” ANA/East Eurasian group and the one with Austro-Melanesian admixture entered the Americas at roughly the same time period (say with the latter taking the coastal route, and the former the ice-free corridor inland) they should have admixed within North America. But there’s no trace of this component north of Costa Rica (I think – damn American Indians for not being willing to offer genetic samples). Some form of active selection against the component is incredibly unlikely, as is a continental wide premodern genocide without admixture. The only plausible explanation seems to be leapfrogging directly into South America without any meaningful settlement further north – although some North Americans (or Beringians) would have to had come along for the ride. Given the proportion of admixture is patchy even in South America, it seems more likely to have been the second migration into the continent rather than the first. “This was published at about the same time as a whole genome analysis which suggested that Oceanians were descended from an earlier migration out of Africa, and not admixed. There are other groups which are supporting multiple out of Africa events now. The plot is getting thick and complicated”. I think we can conclude that the pattern of our origin and dispersal is far more complicated than the simple, single population out of Africa proposed originally. Well, the obvious boring explanation for results sort of like this would be that it came from the Polynesians. I cant help but wonder, is this explanation really ruled out? The first thing that could possibly rule it out is the apparent age of admixture. I could certainly imagine, however, that the program is treating Austronesians and Amerindians as the same population, since they’re more similar to each other than either is to Negritos or Papuans, who are known to have mixed with the expanding Austronesians more than 4000 years ago. Is this possible? The other thing is that the closest affinities aren’t with quite the right populations, but again I can’t help but wonder if this could be explained by things like founder effect. Anyway, I’m wondering how seriously I should take the specifics of the pattern found by this study, as opposed to the fact that the Polynesians are the only group that has left strong independent evidence of its existence, which has roughly the correct affinities to explain the observed pattern. there's not any denisovan in andamanese. there’s not any denisovan in andamanese. Right. But does this mean there is both Adamanese and Oceanian admixture, and that they're inversely correlated for some reason? The finding on Athabascans contradicts pretty solid prior research on the subject, which shows heavy Athabascan admixture with Native Americans, but a distinct, recent (i.e. within about 5,000 years ago) wave of Athabascan admixture none the less, which is corroborated by linguistics and archaeology. This is also contrary to prior research which is quite solid. The usual story has been that there was one founding population that did not include Athabascans, and that due to serial founder effects, only a subset of the North American gene pool arrived in South America. I’m not aware of any prior scholarship showing two separate waves of migration to South America that merged only upon arrival there. Give these two serious breaks with prior research, I’m inclined to be seriously skeptical of this Science paper’s methodology and to look very hard for ways in which they are doing something wrong. That's not the Athabascans. Reich identified this second wave with Algonquians. The Science paper addresses the morphological differences between Paleoamericans and modern natives as well. Their conclusions are similar to ones drawn from the case of Kennewick man, the anthropological differences are caused by local adaptation and drift rather than Paleoamericans being a different population. FWIW, in figure S41 A&C it is seen that like Pericú males, the brachycephalic Buryat outlier also has craniometric affinities to a genetically less related population, which in their case is the Berg sample (Austrians). This distinguishes them from related East Eurasian populations. Onge is part of the same clade as Han, yet the outgroup. Affinity to Onge via stat D(Han, Onge;Mixe Amazonian) indicates less Han like ancestry, not more Onge like, necessarily. Compare direct phylogenetic relatedness of Mixe and Amazonian to Onge specifically via D(African Onge; Mixe Amazonian). Singal = more ancestry from “east eurasian outgroup” later diluted rather than Onge specifically (ancient jomon samples would be interesting to compare). That was actually what I was hoping for as well. Right. But does this mean there is both Adamanese and Oceanian admixture, and that they’re inversely correlated for some reason? "[W]e find that the ancestors of all present-day Native Americans, including Athabascans and Amerindians, entered the Americas as a single migration wave from Siberia no earlier than 23 thousand years ago (KYA), and after no more than 8,000-year isolation period in Beringia." "Following their arrival to the Americas, ancestral Native Americans diversified into two basal genetic branches around 13 KYA, one that is now dispersed across North and South America and the other is restricted to North America." This is also contrary to prior research which is quite solid. The usual story has been that there was one founding population that did not include Athabascans, and that due to serial founder effects, only a subset of the North American gene pool arrived in South America. I'm not aware of any prior scholarship showing two separate waves of migration to South America that merged only upon arrival there. Give these two serious breaks with prior research, I'm inclined to be seriously skeptical of this Science paper's methodology and to look very hard for ways in which they are doing something wrong. That’s not the Athabascans. 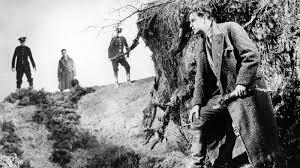 Reich identified this second wave with Algonquians. Agreed. The point about the Athabascans being a distinct people, and the point about there being two v. one distinct basal genetic branches are distinct and independent criticisms. Linguists have rarely weighed into the controversy over whether more than one migration settled the Americas. My friend and teacher, Robert Austerlitz was an exception. He pointed out that linguistic diversity is very high on a world scale among American Indians and that such diversity takes a long time to develop. A single migration of a linguistically homogeneous group would have to have been very ancient (long before the date of about 12,000 years ago that archeologists used to give) to have time to produce this level of diversity. Alternatively, there would have had to be a number of linguistically diverse Old World groups participating in the migration. As Doug Jones points out Johanna Nichols follows the same line of reasoning. She has also identified a number of linguistic strata found on both sides of the Pacific. My experience is that many linguists dramatically overestimate the time depth of linguistic connections (which now and then can be dated due to genetic and archaeological evidence of cultures), mostly because they underestimate the importance of substrate influences, contact with linguistically different people, and motives to become distinct linguistic populations on linguistic evolution. It can evolve rapidly when conditions are right (I think this is why such historically unsupported great time depths for the Anatolian languages are proposed), and slowly when they are not (e.g. Iceland). Any linguistic evidence is pretty much indiscernable from linguistic data alone at some time depth significantly less than about 10,000 years - maybe the practical limit of tracing linguistic relationships from current linguistic data alone is more like 6,000-7,000 years before present. Any linguistic evidence is pretty much indiscernable from linguistic data alone at some time depth significantly less than about 10,000 years – maybe the practical limit of tracing linguistic relationships from current linguistic data alone is more like 6,000-7,000 years before present. No, that's simply due to an elementary mistake: Atkinson et omnes coded the presence or absence of each state of each character as a whole character of its own. That means they counted several characters many times each, exaggerating all differences and therefore the divergence times. (Instead of "character 1: word for X is cognate with (0) a, (1) b, (2) c, (3) d", they used: "character 1: word for X is cognate with a: (0) no, (1) yes; character 2: word for X is cognate with b: (0) no, (1) yes; character 3: word for X is cognate with c: (0) no, (1) yes; character 4: word for X is cognate with d: (0) no, (1) yes". This practice is called "nonadditive binary coding", and several theoretical papers have recommended against it starting in the 1990s.) I'm a phylogeneticist (in biology), and I was quite baffled when I found out that neither the authors nor the reviewers had noticed. The linguistic diversity of the Americas is high, but how high it really is is anybody's guess, because so little research has been done. Lots and lots of blindingly obvious families are recognized, almost each no more diverse than Romance or Slavic or perhaps Germanic, and Americanists hardly try to discover relations between those families. They have a pretty bad reputation for this among other historical linguists! Many linguists have made offhand claims to that effect. Their evidence was all negative. With just a bit of luck, you can easily get to 10,000 at the very least: the Afro-Asiatic family (Semitic, Ancient Egyptian/Coptic, Berber, Chadic, "Cushitic", probably not Omotic) is obvious, strongly suggesting that with hard work you could get well beyond that. Well, I agree that in the past, researchers have tended to neglect the importance of contact to language change. Contact is by far the norm rather than the exception. However, if the New World was settled by a linguistically homogenous group, then the New World would have been unusually free of substrates (until they eventually developed endogenous diversity, naturally). On the other hand, maybe Beringia was crossed by a single small group that was not so homogenous. Maybe the group contained families adopted into the clan who spoke other unrelated languages. In a typical human environment, very likely one of the group’s languages would have quickly pushed aside the others, which would then be extinct. But in the early New World environment, basically the garden of Eden, with plenty of places and resources for populations to expand very rapidly, there could have been early groups that spoke both/all of the languages that came across; moreover, in this scenario, there could easily be an array of different creoles and mischsprachen, combining elements of originally distinct languages. The result would be considerable linguistic diversity from very early on. Any chance of a southern route? New Zealand wasn't settled until the 13th/14th centuries AD, so no. What a time to be alive. All of this will be settled some day. But it seems every few months we get new discoveries. First off I can imagine a scenario where the earliest East Asian population was ‘Papuan’ rather than ‘Mongoloid’. This is certainly so in Southeast Asia and it is quite possible the ‘Papuan’ population had spread considerably north before the Mongoloid phenotype expanded. It is quite possible a remnant of this population, perhaps from Japan, joined the movement into Beringia as a minority. The paper tends to argue that the mixture occurred before the population entered America. Whether the admixed population entered with the majority or not is an open question. As you say: ‘the first round of admixture may have happened in/around Beringia, loitering in the north long enough for the gene variants for dark skin to be purged’. Well yes. The Amazon population is well inland, although presumably within easy reach of the Amazon River. But Polynesians are extremely unlikely to have reached the east coast of South America. “Papuans, who are known to have mixed with the expanding Austronesians more than 4000 years ago”. The two mixed not long before 4000 years ago. In fact the Polynesians are a mix of ‘East Asians’ and Papuans. “Polynesians are the only group that has left strong independent evidence of its existence, which has roughly the correct affinities to explain the observed pattern”. Except that ‘Polynesians’ don’t exhibit much affinity with the population in question at all. The affinity is with Papuans, Australian Aborigines and Andaman Islanders. Who said anything about the East coast. I would assume they would have gotten to the Amazon by crossing the Andes, which were not a barren wilderness at the time but a vibrant agricultural civilization with roads for transportation. As you noted also, Polynesians are something like 30% Papuan by descent. In addition, this component is likely to be amplified in something like a D statistic, since the Papuan-like segments of DNA would have many more distinct SNPs from a Native American perspective than the ancestral Austronesian segments. Onge is part of the same clade as Han, yet the outgroup. 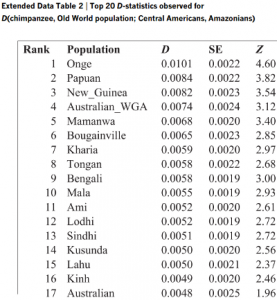 Affinity to Onge via stat D(Han, Onge;Mixe Amazonian) indicates less Han like ancestry, not more Onge like, necessarily. Compare direct phylogenetic relatedness of Mixe and Amazonian to Onge specifically via D(African Onge; Mixe Amazonian). Singal = more ancestry from "east eurasian outgroup" later diluted rather than Onge specifically (ancient jomon samples would be interesting to compare). Yeah, esp. as Ainu is intriguing due to Jomon cranial shape links to Polynesians, which are linked to Early Americans, like the Kennewick Man. There's a potential confound though, there, that the Ainu may have some recent Siberian ancestry that isn't Jomon (together with what they have which is Japanese like). I guess this group do not have the same access to that data. “The Malagash is a Malay, and in their catamarans the the Malays have dared both East and West. Aye, the feller that has the catamaran is the Viking of the South and the water’s his element. Why’re the totem poles in Mexico the same as in Madagascar? Why is their hair and features the same? Because they are the same. Get a globe, Ma’am, and see if the Malays weren’t aptly situated for adventure east or west. And with such gifts of nature as the catamaran, safe as a gull and swift as an arrow, who’s to stop him from overtaking Africa in his wanderings? He settles in Madagascar like birds in an islet–what next but to set his catamaran to flight round the Cape and up the old Ivory. How else came that old ruin that has the looks of Zimbabwe about it? Bonded stones same as Zimbabwe. Aye. Wiki spells ‘Karl’ Peters, Carl. Wonder where his notes went. New Zealand wasn’t settled until the 13th/14th centuries AD, so no. if you had an accurate map of the currents/winds at the time in question then assuming a start point you might be able to get a reasonable picture of viable expansion routes e.g. following the arrows on the map above from Malay gets you to Madagascar. I just read a story about some wreckage during WWII floating all the way from Japan to Madagascar. There was a shipwrecked guy in a lifeboat that ended up there as well. Article is about how Madagascar was likely founded by the survivors of a shipwreck from Java with 30 women on board. Scenario 1: The source of Denisovan ancestry in the Americas is from a proto-Australasian population who later admixed into the proto-Amerind population. A distinct Adamanese-like group lacking Denisovan ancestry also contributed their DNA to the America, creating the structure seen today. Scenario 2: The source of Denisovan ancestry in the Americas is from an admixture event unrelated to the Denisovan ancestry found in Oceania, and represents a separate and distinct admixture event between modern humans and our Denisovan cousins. Amerind populations’ affinity to Oceanians comes from a population that like the Adamanese did not admix with Denisovans. Thoughts? Whether it’s two streams of Oceanian admixture into the Americas, or whether it’s evidence for multiple admixture events with Denisovans (as seems to also have been the case with Nearderthals), I think it’s still an interesting implication. – I was thinking Jomon at first too, but shouldn’t they show affinity to the Japanese too then? Or would that have been missed when they removed much of East Asia from the data set? Are Japanese (or potentially other NE Asian groups) closer to Oceanians than Han? Also @Razib/@Terryt – the phenotype in Northern Europe seems to be the result of some pretty recent selection. Is there evidence of selective sweeps creating the typical East Asian phenotype? If we went back ~30,000 years, do we know if anyone at all would have had a typical East Asian phenotype? * The very low levels of Denisovan ancestry associated with proto-Australasian genetic affinity as similarly low levels is not specific to the Americas. It is also found in East Asia at similar levels in some populations. So, I think that the likely explanation is that a proto-Australasian population made its way all across East Asia, mixing with Denisovans along the way, and then this first contact population gets wildly diluted by multiple subsequent waves of demic migration in East Asia and Southeast Asia, before it reaches something live current levels prior to the LGM and the entry of the founding population into the Americas from Berginia. Once in Berginia, random genetic drift reduces that component in some populations while increasing it in others. * The Andamanese-like wave probably takes a Northern route across Asia. A few of these people (who are Y-DNA D) admix with some Denisovans and pick up adaptive high altitude genes that quickly reach fixation among those who remain in Tibet. (the other Andamanese-like people don't admix because they are at the edge of the Denisovan range and relict populations). Others (particularly those who don't have the adaptation), make their way down the other side of the mountain and end up in eastern India and the Andaman islands, skirting areas already claimed by previous modern human Southern route migrants. Still others never go up the mountain to Tibet and spread thinly across Siberia where they are diluted many times over in subsequent waves. Some of those who never went to Tibet end up in Japan and become the Jomon after incorporating a lot of Siberians and Southern route East Asians met along the way. Others end up in Berginia as a small component of the founding population. Before their small component is too dilute, some of them take the fast track down the Pacific Coast to South America and go over the Andes. Those who make that trip successfully over a few generations, find that their Andamanese genes which gave them traits that were previously useless start enhancing fitness and reach rapidly elevated levels relative to their fellow travelers who lack those genes. But, everywhere else, the Andamanese genes are selectively neutral or fitness reducing, so selection and genetic drift weeds these low frequency genes out of the gene pool over the next 13,000 years. Of course, the trip to Tibet could also go the other direction, from India, up the mountain and back down again, with coast hopping to Andamans and Japan and no good stops elsewhere because other places are already occupied. * The Pre-Andamanese Northern Route Siberians are wiped out by the horrible conditions in Siberia during the LGM except for a few refugia (like the Andaman Islands, Tibetan valleys, Japan, Beringia and a valley or two in the Altai), leaving them with their spotty current distribution. The second wave Southern route Asians (and subsequent Neolithic expansion migration Asians) wipe out and/or demographically overwhelm first contact wave Asians everywhere they meet, but because they can't cross the Wallace line, first wave Asians remain in Papua New Guinea and Australia, waiting to be later picked up by Oceanians as a contributing component. Perhaps second and subsequent wave Southern route Asians have cultural advantages and/or technologies that give them an edge over the first contact wave Asians. @BJ I very much doubt that the settlement of Madagascar by Austronesians was a ship wreck situation. Their navigation and blue sea sailing skills was excellent (much better than modern sailors unaided by tech and maps), and 30 women is a lot to have on a boat already many thousands of miles from home that winds up on an island that no one expected to be there. There’s a potential confound though, there, that the Ainu may have some recent Siberian ancestry that isn’t Jomon (together with what they have which is Japanese like). First off I can imagine a scenario where the earliest East Asian population was 'Papuan' rather than 'Mongoloid'. This is certainly so in Southeast Asia and it is quite possible the 'Papuan' population had spread considerably north before the Mongoloid phenotype expanded. It is quite possible a remnant of this population, perhaps from Japan, joined the movement into Beringia as a minority. "If Austro-Melanesians came to the Americas relatively pure – either prior to the Amerinds or afterwards –"
The paper tends to argue that the mixture occurred before the population entered America. Whether the admixed population entered with the majority or not is an open question. As you say: 'the first round of admixture may have happened in/around Beringia, loitering in the north long enough for the gene variants for dark skin to be purged'. "the obvious boring explanation for results sort of like this would be that it came from the Polynesians. I cant help but wonder, is this explanation really ruled out?" "Papuans, who are known to have mixed with the expanding Austronesians more than 4000 years ago". The two mixed not long before 4000 years ago. In fact the Polynesians are a mix of 'East Asians' and Papuans. "Polynesians are the only group that has left strong independent evidence of its existence, which has roughly the correct affinities to explain the observed pattern". Except that 'Polynesians' don't exhibit much affinity with the population in question at all. The affinity is with Papuans, Australian Aborigines and Andaman Islanders. Kanzawa-Kiriyama’s Jomon paper has some data that may help in making comparisons. There is no difference in allele sharing with Jomon between Pima and Surui. Karitiana share a bit more than them but it is a tiny difference and Surui should show elevated relatedness too if that is related to the Oceanian signal. We also see that among all populations used commonly in studies about population genetics the Japanese are most related to Jomon, safe to say this holds when it comes to the populations in Reich lab’s Affymetrix dataset. They are topped by Ryukyuans and Ainu alone. In light of this, if the signal shown is Jomon-related Japanese affinity should have shown up in Amazonians. Geographically the closest we get is Ami, but that points to Austronesians. Yeah, that's what I was thinking. Where might you end up if you weren't trying but simply taken by currents from point x.
then the only way (according to the map) would be Tasmanians before they lost their boat building knowledge and with a logical condition that the currents there naturally pull well south of New Zealand. No, that’s simply due to an elementary mistake: Atkinson et omnes coded the presence or absence of each state of each character as a whole character of its own. That means they counted several characters many times each, exaggerating all differences and therefore the divergence times. (Instead of “character 1: word for X is cognate with (0) a, (1) b, (2) c, (3) d”, they used: “character 1: word for X is cognate with a: (0) no, (1) yes; character 2: word for X is cognate with b: (0) no, (1) yes; character 3: word for X is cognate with c: (0) no, (1) yes; character 4: word for X is cognate with d: (0) no, (1) yes”. This practice is called “nonadditive binary coding”, and several theoretical papers have recommended against it starting in the 1990s.) I’m a phylogeneticist (in biology), and I was quite baffled when I found out that neither the authors nor the reviewers had noticed. The linguistic diversity of the Americas is high, but how high it really is is anybody’s guess, because so little research has been done. Lots and lots of blindingly obvious families are recognized, almost each no more diverse than Romance or Slavic or perhaps Germanic, and Americanists hardly try to discover relations between those families. They have a pretty bad reputation for this among other historical linguists! Many linguists have made offhand claims to that effect. Their evidence was all negative. With just a bit of luck, you can easily get to 10,000 at the very least: the Afro-Asiatic family (Semitic, Ancient Egyptian/Coptic, Berber, Chadic, “Cushitic”, probably not Omotic) is obvious, strongly suggesting that with hard work you could get well beyond that. I am not convinced that Afro-Asiatic is as old as it is often presumed to be. My informed guess for it is about 7,500 years. Probably, it starts in Egypt which is much more similar to Berber and Semitic at the time. Then, Egypt expands into Ethiopia where new farmers create Cushitic. Out of town men come along marry Cushitic women and head up the Yellow Nile and White Nile (and over the watershed boundary) end up in Chad and give rise to Chadic ca. 5300 BCE. Egypt is unified and adopts an Upper Egypt stand that brings Egyptian out of whack with Semitic and Berber and also evolves a lot independently to cope with a higher level of civilization than the world has ever seen. Omotic turns out to be a creole of Cushitic and Nilo-Saharan (perhaps 4500 BCE as the Nilo-Saharans are booted out by the Chadic herders) that develops at the point of contact and then gets gradually more complex as it is undisturbed for centuries. Before too long, Ethio-Semities come into Ethiopia from the other direction influenced by Cushitic substrate. It doesn't make sense to have such a huge language family pre-Neolithic, but makes all the sense in the world post-Neolithic when Egyptian and North African population densities increased 100 fold in a couple of centuries. Simmer, stir, done. The genetics link many areas where Afro-Asiatic are spoken, but that is a false friend. The language regions is, I think, much younger than the coincident language region. The fact that both Cushitic and Ethio-Semitic peoples have similar levels of Eurasian admixture dated by rolloff to roughly the same time (maybe Cushitic was a few centuries earlier) has really brought me around to that line of thinking. Analogously, Dravidian and Indo-Aryan languages line up reasonably well with ANI and ASI components genetically. But, I think that the Indo-Aryan languages are about 4,000 years old, and that the Dravidian languages probably had a common ancestor within 4,500 years (possibly, much less, if all but a few were wiped out and then a small Dravidian core was able to rebound and take much of the area it had lost but with everyone speaking the dialect of the core that remained at the darkest hour before rebounding, rather than the Dravidian language spoken in that place before the Indo-Aryans arrived). Likewise, many of the West-East divides in Europe recur, in overlapping, but not exactly identical division that make divides look deeper than they are: LBK/Cardial Pottery, then Corded Ware/Bell Beaker, then Centum/Statem, then Catholic/Orthodox, then Capitalist/Communist. Social geography doesn't repeat itself but it rhymes and this can lead to naive overestimates of time depth. Scenario 2: The source of Denisovan ancestry in the Americas is from an admixture event unrelated to the Denisovan ancestry found in Oceania, and represents a separate and distinct admixture event between modern humans and our Denisovan cousins. Amerind populations' affinity to Oceanians comes from a population that like the Adamanese did not admix with Denisovans. Thoughts? Whether it's two streams of Oceanian admixture into the Americas, or whether it's evidence for multiple admixture events with Denisovans (as seems to also have been the case with Nearderthals), I think it's still an interesting implication. @Easy - I was thinking Jomon at first too, but shouldn't they show affinity to the Japanese too then? Or would that have been missed when they removed much of East Asia from the data set? Are Japanese (or potentially other NE Asian groups) closer to Oceanians than Han? Also @Razib/@Terryt - the phenotype in Northern Europe seems to be the result of some pretty recent selection. Is there evidence of selective sweeps creating the typical East Asian phenotype? If we went back ~30,000 years, do we know if anyone at all would have had a typical East Asian phenotype? * The Andamanese-like wave probably takes a Northern route across Asia. A few of these people (who are Y-DNA D) admix with some Denisovans and pick up adaptive high altitude genes that quickly reach fixation among those who remain in Tibet. (the other Andamanese-like people don’t admix because they are at the edge of the Denisovan range and relict populations). Others (particularly those who don’t have the adaptation), make their way down the other side of the mountain and end up in eastern India and the Andaman islands, skirting areas already claimed by previous modern human Southern route migrants. Still others never go up the mountain to Tibet and spread thinly across Siberia where they are diluted many times over in subsequent waves. Some of those who never went to Tibet end up in Japan and become the Jomon after incorporating a lot of Siberians and Southern route East Asians met along the way. Others end up in Berginia as a small component of the founding population. Before their small component is too dilute, some of them take the fast track down the Pacific Coast to South America and go over the Andes. Those who make that trip successfully over a few generations, find that their Andamanese genes which gave them traits that were previously useless start enhancing fitness and reach rapidly elevated levels relative to their fellow travelers who lack those genes. But, everywhere else, the Andamanese genes are selectively neutral or fitness reducing, so selection and genetic drift weeds these low frequency genes out of the gene pool over the next 13,000 years. * The Pre-Andamanese Northern Route Siberians are wiped out by the horrible conditions in Siberia during the LGM except for a few refugia (like the Andaman Islands, Tibetan valleys, Japan, Beringia and a valley or two in the Altai), leaving them with their spotty current distribution. The second wave Southern route Asians (and subsequent Neolithic expansion migration Asians) wipe out and/or demographically overwhelm first contact wave Asians everywhere they meet, but because they can’t cross the Wallace line, first wave Asians remain in Papua New Guinea and Australia, waiting to be later picked up by Oceanians as a contributing component. Perhaps second and subsequent wave Southern route Asians have cultural advantages and/or technologies that give them an edge over the first contact wave Asians. I very much doubt that the settlement of Madagascar by Austronesians was a ship wreck situation. Their navigation and blue sea sailing skills was excellent (much better than modern sailors unaided by tech and maps), and 30 women is a lot to have on a boat already many thousands of miles from home that winds up on an island that no one expected to be there. The very low levels of Denisovan ancestry associated with proto-Australasian genetic affinity as similarly low levels is not specific to the Americas. That's not my point. My point is that the populations with the most affinity to Adamanese and Australasians have the least affinity to Denisovans? I am not convinced that Afro-Asiatic is as old as it is often presumed to be. My informed guess for it is about 7,500 years. Probably, it starts in Egypt which is much more similar to Berber and Semitic at the time. Then, Egypt expands into Ethiopia where new farmers create Cushitic. Out of town men come along marry Cushitic women and head up the Yellow Nile and White Nile (and over the watershed boundary) end up in Chad and give rise to Chadic ca. 5300 BCE. Egypt is unified and adopts an Upper Egypt stand that brings Egyptian out of whack with Semitic and Berber and also evolves a lot independently to cope with a higher level of civilization than the world has ever seen. Omotic turns out to be a creole of Cushitic and Nilo-Saharan (perhaps 4500 BCE as the Nilo-Saharans are booted out by the Chadic herders) that develops at the point of contact and then gets gradually more complex as it is undisturbed for centuries. Before too long, Ethio-Semities come into Ethiopia from the other direction influenced by Cushitic substrate. It doesn’t make sense to have such a huge language family pre-Neolithic, but makes all the sense in the world post-Neolithic when Egyptian and North African population densities increased 100 fold in a couple of centuries. Simmer, stir, done. Likewise, many of the West-East divides in Europe recur, in overlapping, but not exactly identical division that make divides look deeper than they are: LBK/Cardial Pottery, then Corded Ware/Bell Beaker, then Centum/Statem, then Catholic/Orthodox, then Capitalist/Communist. Social geography doesn’t repeat itself but it rhymes and this can lead to naive overestimates of time depth. Yeah, that’s what I was thinking. Where might you end up if you weren’t trying but simply taken by currents from point x. "Tasmania was the end result of island hopping"
Not so. People walked to Tasmania from Australia at a time of low sea level. Tasmanians/Australian Aborigines are very different from Polynesians/New Zealand Maori. New Zealand is indeed the 'end result of island hopping', but via the wider Pacific Islands rather than from Australia. That Pacific movement started near the Bismarck Archipelago with the mix of Malay/SE Asians with the Papuans of northern New Guinea/Melanesia. Not so. People walked to Tasmania from Australia at a time of low sea level. Tasmanians/Australian Aborigines are very different from Polynesians/New Zealand Maori. New Zealand is indeed the ‘end result of island hopping’, but via the wider Pacific Islands rather than from Australia. That Pacific movement started near the Bismarck Archipelago with the mix of Malay/SE Asians with the Papuans of northern New Guinea/Melanesia. Not so. People walked to Tasmania from Australia at a time of low sea level. Okay, forget Tasmania but isn’t the theory that people got to Australia itself as the result of island hopping? So if the people who arrived in Australia knew about boats and then lost that knowledge then the time span between arriving and losing that knowledge would be one condition. A second condition might be the currents would need to push boats well south of New Zealand down to the Antarctic current shown on the map which would carry them to Tierra del Fuego. The seeming distance might argue against it but given the curvature of the earth is the nautical distance along the edge of the Antarctic any greater than the nautical distance between Malaya and Madagascar? 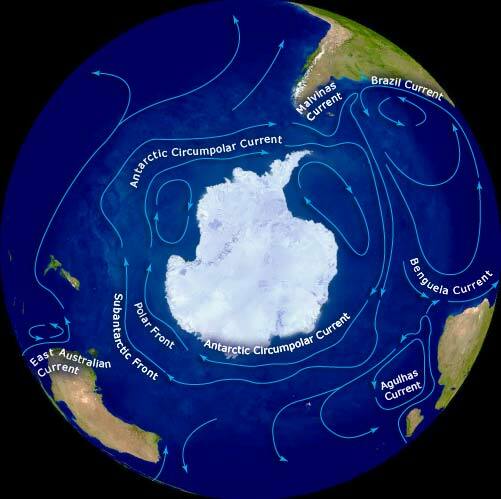 Anyway, not saying it’s likely just the only viable looking option based on one map of ocean currents. "forget Tasmania but isn’t the theory that people got to Australia itself as the result of island hopping?" Not so much 'island hopping', but an 'island hop'. The first people to reach Australia certainly arrived by boat, presumably from the triangle of islands formed by Timor, Sumba and Flores/Alor (Y-DNA C1b and mt-DNA N). It seems to have been after some period that humans were able to next reach New Guinea, Borneo and the Philippines (Y-DNA K2 and mt-DNA M). Much later still humans were able to expand into the wider Pacific (a mix of haplogroups but primarily Y-DNA C1b/O1 and mt-DNA B4a). The determining factor was probably the progressive improvements in boating technology rather than simple ocean currents. "So if the people who arrived in Australia knew about boats and then lost that knowledge"
People in some parts of Australia, such as Tasmania, did lose the knowledge. But people in many parts of Australia used bark and reed canoes on rivers and lakes. Presumably it was this sort of craft that had carried them to Australia in the first place. "A second condition might be the currents would need to push boats well south of New Zealand down to the Antarctic current shown on the map which would carry them to Tierra del Fuego". The problem with that is that the movement east from SE Asia was north of Australia via New Guinea rather than south of Australia. I can understand how Polynesians could have reached the west coast of America but they have a lower proportion of the relevant genes. That’s not my point. My point is that the populations with the most affinity to Adamanese and Australasians have the least affinity to Denisovans? This was already answered CupOfCanada. Andaman Islanders do not have increased Denisovan ancestry. There is nothing to be confused about. No. CupOfCanada has a good point. The populations in the Amazon have an ancestry component of about 2% which is closest to modern Australasians and Andamanese, but it isn't necessary Andamanese itself. It is simply generically Paleo-Asian. 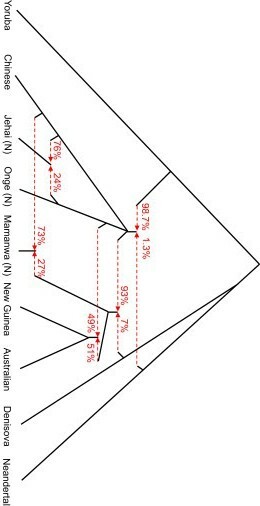 Other populations in the Americas with a generic proto-Australasian genetic affinity at trace levels have Denisovan ancestry that is more or less proportionate to the Australasian genetic affinity, even though both components combined (generic proto-Australasian and Denisovan combined) are on the order of 0.5% or less of their ancestry. The remarkably low Denisovan level in Amazonian populations with the highest Paleo-Asian component in the Amazon implies that the source of 2% or so of Paleo-Asian ancestry in some Amazonian populations is different from the source of the much lower levels of Paleo-Asian ancestry in other populations in the Americas. 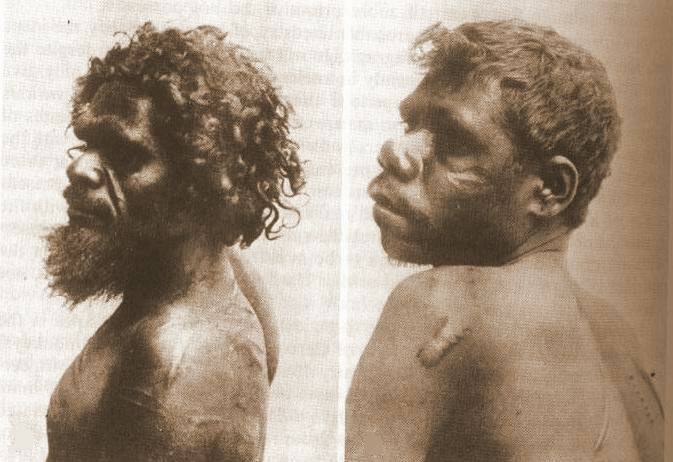 It also rules out the scenario that any of the Paleo-Asian ancestry in the Amazon can come from actual Papuan ancestors or actual Australian Aborigine ancestry, or for that matter Paleo-Asian ancestry from Phillippino Negritos. An yet, the fact that this component has affinity to Papuans and Australians as well as Andamanese implies that this component is not simply an example of the same population as the Andamanese themselves. The populations in the Amazon have an ancestry component of about 2% which is closest to modern Australasians and Andamanese, but it isn’t necessary Andamanese itself. It is simply generically Paleo-Asian. No large population took catamarans through the Roaring Forties. A large population in Madagascar seems to have fished and traded around enough that some of them went up around the Cape and some of those took the trade winds to Brazil. It’s a real pity the Tamil libraries were destroyed in their late civil war. Sure, I'm suggesting something closer to the opposite i.e. that discussions of long voyages generally presume human agency is the main driving force but what if during this period it was only 10% sailing skill and 90% currents? As a "what if" that would then lead you to an accurate map of ocean currents and then for any origin point x or destination y you could see where the possible start / end points might be just based on the currents and see if they correlate with known population movements. If they did then that might solve various mysteries. the distances are 3,700 vs 5,900 nautical miles - so still a big difference but because of the sphere shape not as big a difference from first sight. 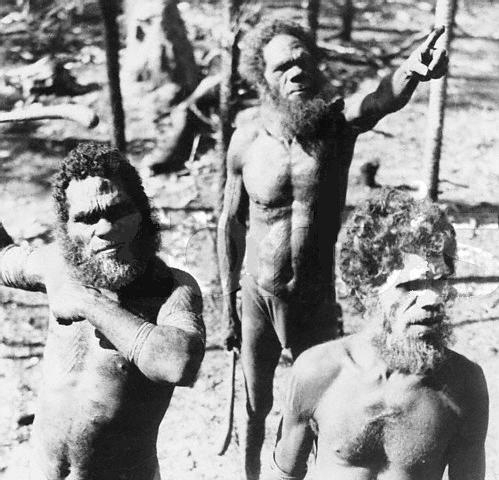 "Despite the extremely cold climate in which they lived, early Yahgan wore little to no clothing until after their extended contact with Europeans." Among other things it says they had a higher metabolic rate that helped keep them warm which makes me wonder if neanderthals (or equivalent) had something like that? I find it it difficult to believe that that Malagasy ancestry would explain an affinity to the Onge, as I don't believe there's much affinity between those two groups, no? @notanon "is the nautical distance along the edge of the Antarctic any greater than the nautical distance between Malaya and Madasgascar?" It's a real pity the Tamil libraries were destroyed in their late civil war. Sure, I’m suggesting something closer to the opposite i.e. that discussions of long voyages generally presume human agency is the main driving force but what if during this period it was only 10% sailing skill and 90% currents? As a “what if” that would then lead you to an accurate map of ocean currents and then for any origin point x or destination y you could see where the possible start / end points might be just based on the currents and see if they correlate with known population movements. the distances are 3,700 vs 5,900 nautical miles – so still a big difference but because of the sphere shape not as big a difference from first sight. only to find he had something called Acromegaly which is linked to human growth hormone and gigantism. Which makes me wonder if there was some benefit to Acromegaly in the past (at least when young) or whether those dudes had higher levels of HGH for some other reason - seeing as body builders use HGH for muscle mass. I find it it difficult to believe that that Malagasy ancestry would explain an affinity to the Onge, as I don’t believe there’s much affinity between those two groups, no? Picking the right current is a skill, and the Roaring Forties are one of the choppiest and least survivable currents. Nobody took any large groups through the Roaring Forties in a dugout catamaran. No doubt Joshua Slocum types tried it, and maybe some lived, but they’d be lone rogue males. You are right. I was wrong. These genetics discoveries are for a much earlier time period than I was thinking of, and different genes. Still think they hugged the African coast and followed the trade winds to Brazil, rather than cross the whole dang Pacific and climb the Andes and follow the Amazon downstream. Which makes me wonder if there was some benefit to Acromegaly in the past (at least when young) or whether those dudes had higher levels of HGH for some other reason – seeing as body builders use HGH for muscle mass. Okay, forget Tasmania but isn't the theory that people got to Australia itself as the result of island hopping? Anyway, not saying it's likely just the only viable looking option based on one map of ocean currents. Not so much ‘island hopping’, but an ‘island hop’. The first people to reach Australia certainly arrived by boat, presumably from the triangle of islands formed by Timor, Sumba and Flores/Alor (Y-DNA C1b and mt-DNA N). It seems to have been after some period that humans were able to next reach New Guinea, Borneo and the Philippines (Y-DNA K2 and mt-DNA M). Much later still humans were able to expand into the wider Pacific (a mix of haplogroups but primarily Y-DNA C1b/O1 and mt-DNA B4a). The determining factor was probably the progressive improvements in boating technology rather than simple ocean currents. “A second condition might be the currents would need to push boats well south of New Zealand down to the Antarctic current shown on the map which would carry them to Tierra del Fuego”. Sure, the odds of a breeding population surviving drifting on a boat south from Australia to the Antarctic current and then all the way east from there to Teirra del Fuego must be about a million to one even if the people involved were tough as rocks.